Anyone who has spent time gaming on a PC knows that good hardware can make all the difference in your experience. However, good peripherals, such as a mouse, keyboard, and headset, can also enhance your gaming experience in a variety of ways. A good keyboard won’t just make typing easier and more comfortable, but it will have a profound impact on gaming in a way you might not expect. A good gaming keyboard will have responsive, high quality keys as well as plenty of features to let you customize your experience. While many gaming keyboards can reach into the hundreds of dollars, we decided to focus our list on more budget friendly options so that you can spend the extra money elsewhere while still improving your gaming setup. We took a look at the best gaming keyboards under fifty dollars, in order to bring you high quality features at a price that won’t break the bank. We began our search for the best budget gaming keyboard by looking at keyboards geared towards gaming, and narrowing the field by price. We were sure to pay attention to keyboards from reputable manufacturers in order to guarantee quality. We determined this final list by pouring over user reviews and feature lists as well as taking into account what features are most important in a gaming keyboard. Once we had that criteria, we tailored our list to the gaming keyboards that will give you the best experience possible while also remaining affordable. We compared every nuance of each of these keyboards and weighed each category in order to bring you the five best gaming keyboards under $50 on the market. When it comes to any keyboard, the most important aspect is undoubtedly the keys. High quality keys will last for millions of keystrokes. Not only are the types of keys important for longevity, but different types of keys can give you different experiences and features depending on which you choose. The two main types of keys seen today are membrane and mechanical, and both have their benefits. Membrane keys are cheap to produce and the savings are passed along to you, however, they typically have shorter lifespans than their mechanical counterparts. Mechanical keys come in several different colors, and each sport a different set of features and specifications. We gave extra points to keyboards that not only included mechanical switches, but that let you choose what type of switch you want. We also gave extra points to mechanical keyboards that went with higher quality Cherry MX switches. A good gaming keyboard will have switches that will last you a long time as well as providing proper feedback and responsiveness so that you’re never held back by the quality of your keys. Backlighting is one of the most popular features in gaming keyboards today. Backlighting not only lets you personalize the look of your keyboard, but also helps you when gaming late at night. While many keyboards come with a single, static backlight color, there are many gaming keyboards that go even further by providing not only more colors, but enhanced and customizable effects. We gave extra points to keyboards that provided customizable backlighting effects, while still keeping the price down. The next aspect of each of these gaming keyboards we looked at was the size of each. While different people prefer different keyboard sizes, smaller keyboards are typically seen as better for gaming as to keep your hands closer together. We paid attention to the size of each keyboard, as well as the other features packed into each form factor in order to bring you the best list possible. A major way gaming keyboards set themselves apart from normal keyboards are programmable keys, or macro keys. Programmable keys are vital to gaming keyboards as they set aside keys to be programmed and use as you please giving you maximum control over your keyboard. Being able to quickly switch weapons or access certain commands by simply hitting a button of your choice can make all the difference when you need it most. We gave extra points to keyboards that include macro keys, and paid attention to the positioning and number of these keys on each keyboard. Software is often not something people associate with gaming keyboards, or keyboards in general. However, the software both built into your keyboard and installed onto your pc can make a huge difference when gaming. Anti-ghosting is the most important inclusion in a gaming keyboard, and can make a massive difference when you’re gaming. Many budget and non-gaming keyboards only allow you to press a small number of keys at a time, which can limit your ability to react and make quick actions when gaming. A good gaming keyboard will include quality anti-ghosting software that will keep you in the fight, and we gave extra points to keyboards that included this software. Our #1 pick for best gaming keyboard under $50 is the Redragon K552 Kumara. 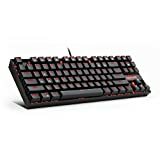 This Redragon keyboard does cut a few corners, but it’s able to provide everything we want in a gaming keyboard at an incredibly affordable price. Starting with key type, the Redragon comes with mechanical switches, for maximum feedback and longevity. Instead of going with Cherry MX switches, however, the Redragon goes with a custom green switch that is the equivalent of a Cherry MX Blue. This type of switch is perfect for tactile feedback to let you know when you can key press again, which will help to improve your reaction time and responsiveness while gaming. The Redragon model we reviewed sports a single, red backlight that is brightness adjustable, but not color adjustable. However, the red backlight is a great choice for most gaming setups and is perfect for people looking for a simple backlighting solution. And for those looking for a little more color the Kumara does come in a few other models, with varying backlighting effects. The Redragon is a ten keyless keyboard that is the perfect size for any gaming setup. The small form factor will reduce strain during marathon game sessions and makes it portable. The area the Redragon falls short in is programmable keys, as it sacrifices customizable key functions in order to keep its form factor down. However, for anyone who doesn’t care about programmable keys the Redragon won’t disappoint. The Redragon does include high quality anti ghosting software that allows you to press as many keys as you want, for maximum gaming potential. While it doesn’t sport too many flashy features, the Redragon keyboard packs top of the line quality into an affordable and aesthetically pleasing package, landing it in the top spot on our list. Our second pick for best gaming keyboard under $50 was the Cooler Master Devastator II. The Devastator isn’t just a great deal for a keyboard, but the included mouse is the perfect way to upgrade your entire peripheral setup at a minimal price. 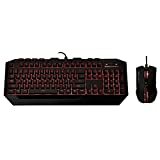 This Cooler Master keyboard provides incredible quality and features at an amazing price point. They are able to provide this beginning with the switches, which are not mechanical but instead a new mem-chanical hybrid switch that combine the tactile feedback of mechanical switches with the affordability of membrane switches. The backlighting on this keyboard is also a static color, though you can chose from red, blue, and green at this price point. The light displayed on the keyboard is mirrored on the included mouse, for a seamless aesthetic. The Devastator includes programmable multimedia keys for quick control over your audio, and gives you the ability to easily adjust your audio. This board also features Cooler Master’s anti ghosting software and LED program. 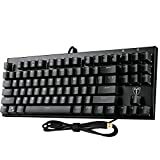 If you don’t mind the lack of mechanical switches, the Cooler Master keyboard is perfect for anyone looking for a great keyboard with the added inclusion of a mouse. Our third pick for best budget keyboard is the Logitech G105 for its customization options and top quality build. The logitech keyboard features Logitech’s membrane switches, as well as custom keycaps for the WASD and arrow keys, which is great for gamers. The backlighting is a simple blue effect that has two brightness levels. The quintessential Logitech blue is perfect for any gaming setup. This keyboard sports a full board design including a numpad that makes it perfect for gaming and typing. The larger form factor also makes room for programmable “G” keys. These keys, located on the left side of the board, give you quick access to in game commands that would otherwise take multiple clicks and key presses. The multi key input software allows you to press up to five keys at once, and the software comes with the added option to disable the windows key while you’re gaming to prevent unwanted gaming interruptions. The Logitech G105 is the perfect keyboard for those looking for a logitech design and who want programmable keys without sacrificing a number pad. Our next choice for best gaming keyboard is the Razer DeathStalker Essential Gaming keyboard. The Razer deathstalker Essential sports Razer’s low profile chiclet membrane keys that are perfect for fast response and minimal noise. These keys are the best low-profile keys we tested and we assigned extra points because of this. The DeathStalker Essential doesn’t sport any backlight, which may be disappointing to those looking for Razer’s signature green color. At this price point, Razer has opted to not include any form of backlight. This keyboard is a full length keyboard, and just like the Logitech keyboard the num pad makes this the perfect keyboard for typing and gaming. The Razer software is among the best we tested, as the Razer Synapse 2.0 is cutting edge software that automatically syncs the games keyboard to a cloud server in order to download driver and firmware updates, while saving your personalized settings. Further, the Anti-ghosting software allows you to press as many keys as you’d like and have them actuate. Despite its lack of features, the Deathstalker is a solid keyboard that is sure to provide the best software experience available with the signature Razer style. The final pick on our list is the Tomoko 87 Key mechanical gaming keyboard. The Tomoko offers Blue Switches that provide you with a clicky tactile feedback that is certain to improve accuracy, giving you a competitive edge. And these keys are rated for 50 million lifetime keystrokes. The Tomoko is an 87 key keyboard, that lacks a number pad in order to cut down the form factor into a more gaming friendly one. The main design feature of the Tomoko is its water resistant feature, as it sports three holes on the bottom for water drainage. The Tomoko doesn’t have any form of backlighting, in order to make the water resistant design possible. This feature does protect your keyboard from any accidental spills that may occur during intense gaming sessions. This keyboard has Function shortcuts, giving you easy access to media controls in order to control your background audio while gaming. And the N-Key rollover anti ghosting allows multiple keys to be pressed at once without conflict. At a budget price, the Tomoko gives the unique feature of waterproofing as well as high quality mechanical switches. A good gaming keyboard makes a huge difference in your gaming experience, as more responsive keys, customizable lighting, and anti ghosting software can give you a competitive edge when you need it most. Our number one pick was the Redragon K552 for its high quality design, keys, and gaming software as well as its backlight options. Each of the keyboards featured here brings something different to the table, while still providing you with the best gaming keyboard possible at an affordable price. In this budget range there is still some great options to choose from. We take a look at the Best Gaming Keyboards under $50 and what features are critical.